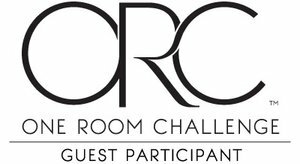 Welcome back for Week 2 of the One Room Challenge! As a reminder, this time I'm working on an update for my teen daughter's room. We're transitioning her to a more modern, grown up space. Here's where we're starting, catch up on the "before" post from Week 1 here. There's going to be some give and take for both of us in this process! So, her main requests have been green (one thing we definitely agree on! ), wood tones, a more modern vibe, and generally calming things down a bit. We've known a makeover was coming for a while even if we hadn't worked out the details, so using some of what we already have and a few things we've started collecting, here's a loose plan of where we're headed. *Can one house hold TWO green upholstered headboards? Ours is about to! The green we're using in her room will be a deeper emerald green though rather than the brighter green I use in the rest of the house. I don't have a plan for artwork on that wall yet, maybe just one statement piece over the bed. *We're keeping her current white with black border duvet cover and shams and just adding in new accent pillows. I'm still looking for the perfect moody floral fabric for a few pillows to tie everything together. *We'll keep her current bamboo nightstands and repaint them a glossy white with gold hardware. I've shown you the vintage bamboo dresser we found to use in her room. She really wants to keep it the wood tone and I really want to paint it glossy dark green, so we'll see how things come together (the dresser has decals on the front that I definitely want to remove and a few condition issues to address). *As much as I'd love to put in a pretty light fixture, a ceiling fan is non-negotiable. She uses it all the time. We are replacing the old one though with this one that is a bit more sleek. I'm thinking about painting the metal base gold and leaving the blades white, but not sure on that yet. I might just want it all to stay white and disappear into the ceiling. *I'm looking for a bench to go at the end of her bed. If I don't come across a good one in time, I'll probably pull in the one from our bedroom for now. *We've already removed the antique armoire from her room and replaced it with a simple Ikea desk and ghost chair. She's loving the space to do her homework. We'll likely do some sort of gallery wall over the desk. Her large "E" marquee letter will stay and get repainted, but we don't have a plan for any other artwork in the room yet. *I'm looking for a new mirror to go over the dresser. I want something really clean and simple and like the idea of a round mirror there. *I've bought curtain fabric similar to the curtains shown and just need to get it sewn up with blackout lining. Debating on the rod... with white walls and the black & white lattice print fabric I don't know if I want the rod to be black or white. What do you think? *Lastly, the rug is totally up in the air. I threw one in the plan just for fun but am not sure if we'll use one or not. She rolled up her old rug a while back and hasn't had anything but the carpet, but I like the look of layering a contrasting rug on top. If we use one it will have to be just the right pattern to mix in with everything else going on. If you read all of that, did you get the idea that many of the room details are still up in the air? We're set on the big ticket items I think but still have so many little things to round up. We've been working on prepping the room for paint and plan to have the walls and ceiling done by the end of Friday. See you next week for an update and hopefully more concrete plans! Be sure to stop by and check in on projects from all of the featured designers and guest participants. I'm really liking the directing you're going. Still fun and colorful, of course, but more grown up. Black and white looks great with green. Oh, and I recognize that floral lumbar pillow! It looks really good with the color scheme. This looks like an incredible plan - I can't wait to see it. We moved to a new house and out of state so we are working on my daughter's room right now and have similar exchanges. You asked so here's my vote - for the drapes, you have a photo that shows a black curtain rod against a white wall with the black and white drapes. I like the black rod - it will look like a stripe when the drapes are open which will coordinate nicely with your striped accent wall. I knew you would come up with something fantastic Jennifer! I love how the black and white striped wall works for this completely different design that where you are starting, it's gorgeous with the green and the wood of the dresser!!!! Fun looking room! 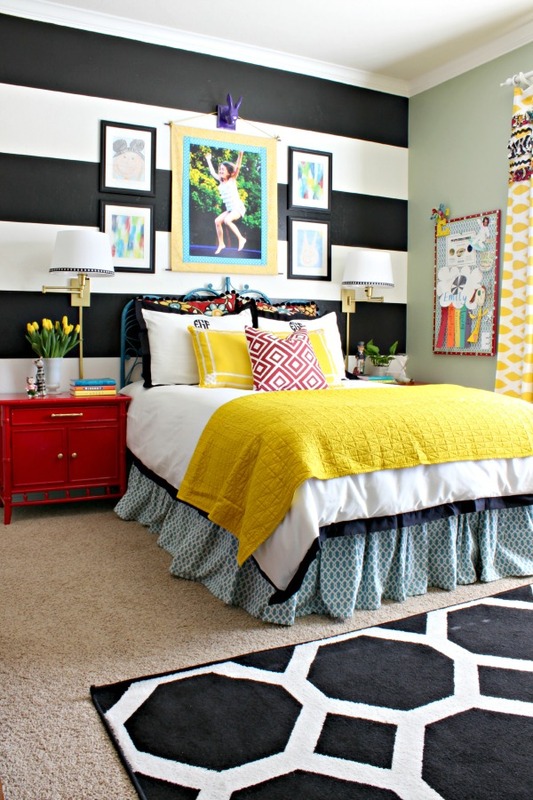 Love the pops of color and pattern play! I've always loved your designs...wonderful ideas once again! How great that you get to work together. 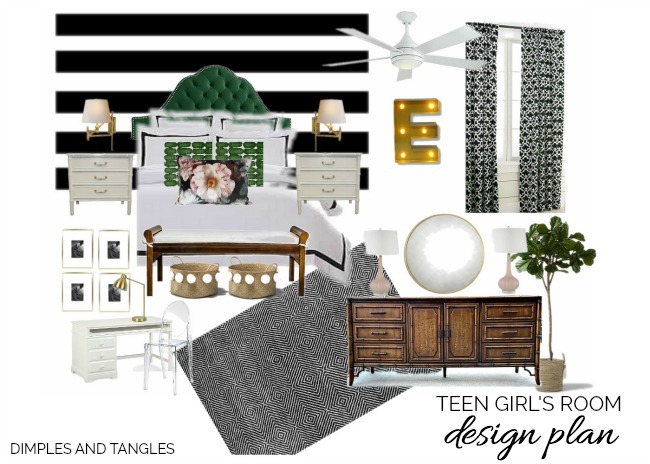 Before long, you will be helping her design her college dorm room! The headboard and striped wall combo will look fabulous. For the curtain rod, how about a sleek, modern lucite one with gold accents similar to your towel bar in your powder bath? Came here to say the same thing. :) Lucite with brass would be really beautiful! I was just planning to work with what we already had, but Yes! That would be amazing!! I think keeping the dresser wood as opposed to painting is a better choice ~ warmer and more interesting. Have you seen the new Fandeliers? My niece just installed one and the fan is incorporated into the chandelier and you don't even know it's there. She and her husband love it. Hi Jennifer, Your plans, so far, are looking fantastic! For the dresser, I LOVE the look of wood and black together, so how about leaving the drawer and door fronts wood and painting the rest black? I vote for a white curtain rod so it disappears, just like the ceiling fan. I'm leaning towards no art above the bed - those black and white stripes look great just as they are with the green headboard in front. So, there's my 2¢! But your rooms always look so great. I can't wait to see what agreement you come to on the dresser!! And for the rod...how about gold?! This is going to be such a fabulous room for your daughter! I'm a little bit crazy over that ceiling fan! Where did you get it? Why didn't they design it in gold? I can't paint. I have no patience! HELP! Maybe I should say, send help :) Actually, I know someone I can con in to painting it for me if you tell me where I can buy it.